Hydraulic Engineering and Hydropower, Drinking Water and Decorative Fountains in Augsburg is part of the Tentative list of Germany in order to qualify for inclusion in the World Heritage List. Always trying to stay ahead of the curve, i.e. the upcoming German nominations, and using a Deutsche Bahn free travel reward earned by countless commutes to Berlin I stayed for a night in Augsburg. I had passed through Augsburg often before when travelling between Stuttgart and Munich, but never made the effort of visiting. So it came as a pleasant surprise to find a lovely Southern German city. I did most of my site seeing in the morning walking first in the direction of the Lech river and visiting the locations there. And then I headed back into town. I can confirm there is plenty of canals and water management in the city, but I did not see an outstanding component worthwhile mentioning. Augsburg overall, though, holds plenty of interesting churches and other buildings, many due to the patron of the town, Jakob Fugger. Once dubbed the richest man in the world he ruled from Augsburg a banking and trading empire with some mining operations thrown into the mix for good measure. To this day the Fugger Bank operates as private bank in Augsburg. 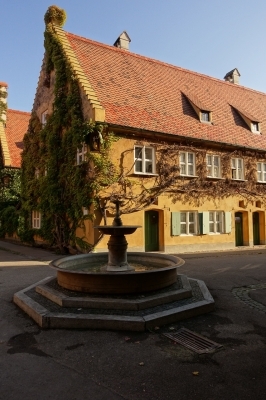 The most notable structure of Fugger is the Fuggerei, the first social housing complex that operates to this day. For I believe 0.5 EUR per year and daily prayers for the Fugger family a Catholic in need can reside in the complex. Unfortunately, Augsburg was heavily bombed in the Second World War as several German weapon factories were located in the town. To this day Augsburg is a center of German Engineering. Much was rebuilt and saved, but it's not a medieval town anymore. An Augsburg unharmed by bombs in the 2nd World War would have surely made the list. The Fuggerei alone would deserve inscription were it in its original state instead of being heavily reconstructed. The town center to this day boasts an impressive number of historical houses and remnants of Fugger's greatness. As is Augsburg finds itself in a bit of a conundrum. It's a very nice place to visit and I would encourage you to spend a few hours here if you pass through. 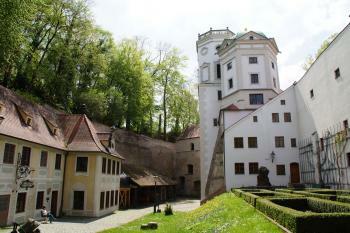 But without world heritage site, Augsburg is in the second league of German tourist sites. So us Germans got creative: Es kann nicht sein, was nicht sein darf! (It may not be, what must not be). We tweaked the application to focus on the unique and influential water management of Augsburg. I feel reminded of the original Naumburg nomination that turned the whole Saale Unstrut region into the most significant region of the Medieval Age. Same for Augsburg: I am hard pressed to see how this has more than regional importance. Augsburg is neither in the middle of the desert nor in the lowlands, places where I would understand water management having an exceptional value. Using canals and pumps doesn't make a world heritage site. Especially as nearby Ulm isn't that different. Personally, as with other sites, I would prefer the honest approach: Submit the old town and run with it. It worked for Naumburg. Augsburg is well connected to all parts of Germany by rail (Munich in the East, Stuttgart/Ulm to the West). From the railway station it's a 15min walk to the city center. On my way to Wies I travelled via Augsburg from where I took the regional train to Füssen. It was a weekend and normally that means that German trains are quiet and seating is available in abundance. Little did I know as the train was filled with tourists from all over the world. I managed to squeeze myself into one of the last free seats and was wondering: What is happening here? Are they all going to Wies? I knew Füssen has a nice old town, but this nice? Only when we arrived in Füssen and images of Neuschwanenstein (T) greeted me, did I understand. Travelling westwards will take you to Ulm for the Ice Age Art. There are also Pile Dwellings in the proximity. And the Limes passes near Augsburg. Augsburg is the birthplace of Berthold Brecht, probably the greatest German dramaturg (and poet) of the 20th century. Fittingly, Augsburg is also the home of the Augsburger Puppenkiste, Germany's most reknown puppet theatre. Augsburg is also the area in Germany with the most public holidays. Augsburg being part of Bavaria is already plenty blessed. In addition they as sole town in Germany celebrate a town specific public holiday in comemorance of the end of the 30 Years war: the Peace Festival (Friedensfest). It appears that Augsburg has, across at least 6 centuries, been a “Cluster Wasserwissen” (“Water knowledge Cluster”), and even the “Silicon Valley der Wassertechnologie” (Genuine quotes!) - and has constructed its nomination for 2019 around that aspect of its history. Now, my Michelin guidebook seemed to know nothing of this beyond a very brief mention of “3 Renaissance water fountains”. But, having seen at least some of the aspects and having read about others, it could be that Augsburg might have latched on to a "winner". And of course, once it has been inscribed and can sport that UNESCO logo, who will know or care that it wasn’t inscribed for it's cityscape, cathedrals etc? The section “Vorteile für Augsburg” (“Benefits for Augsburg”) from this web page is remarkably candid about the anticipated benefits – “…… ein deutlicher Zuwachs an Touristen zu erwarten, die den Hotels, Restaurants und Geschäften zu einem Aufschwung verhelfen würden – was letztendlich wieder allen Augsburgerinnen und Augsburgern wirtschaftlich zugutekäme.” (“… a significant increase in tourists would be expected, which would help hotels, restaurants and shops to boom - which would ultimately benefit all Augsburgers economically”). When we visited in Sept 2018, the city was geared up for nomination - indeed it occurred to me that the ICOMOS field visit would probably be imminent. In the main Maximilian Museum, an exhibition titled “Wasser Kunst Augsburg” was taking place, whilst, along the Lech canals, banners proclaimed “Infoart Austelliung im offentlichen raum im rahmen der interessbekundung wasswirthschaft als UNESCO” ("open air info art exhibition in the context of water management for UNESCO"). Finally, in front of the Perlachturm, a large exhibit had been set up titled – “Welterbe Bewerber Augsburg. Entdecken sie die 22 Stationen des Augsburger Wassersystems” (“Augsburg World Heritage Candidate. Discover the 22 Stations of the Augsburg Water Systems”) followed by 11 professionally produced information boards each containing a photo and description of 2 of the “stations”. It ended with a further board showing a map. But “22 locations” seemed rather more than the UNESCO T List description had envisaged. What and where are they? I have found the very map here on the Web (It rather nicely divides them into 6 different “categories” with 2 canal areas, a butchery (!!! – see later), 3 monumental fountains, 4 waterworks, 2 “hydraulic structures” and 10 power plants). And then see this link to the individual locations. Neither of the above links specifically indicates how the core zone is to be defined and I have been unable to access the Nomination file. The most northerly locations on the map (19/20/21) are situated in towns outside Augsburg and the total distance from North to South (21 – 12) is around 40kms. So we must expect a number of “core zones”. With 1 and 3 to 9 situated reasonably closely together in central Augsburg one wonders if the nomination will, by stealth, attempt to include a significant %age of the city centre within a single zone! Does the map’s “grey area” indicate such a zone? Another map titled “23 Denkmäler der Wasserwirtschaft Wasserbau und Wasserkraft, Trink wasser und Brunnenkunst in Augsburg – 2019 UNESCO-Welterbe?” shows both additions and subtractions compared with the 22. It doesn’t appear that this list was intended to be put forward for nomination in full (one entry states that the Klostermühlenmuseum Thierhaupten doesn’t have “UNESCO potential”) but it is still interesting to compare the 2 lists. The general thrust is that the “23” contained many more city centre sites (including another fountain and the Maximilian and Stadt Textil Museums), together with the entire “Stadtwald” (which is only represented on the “22 list” by 1 location within it, but may yet be fully included), whilst excluding the Power Stations outside the city. The T List description refers frequently to the City’s water-related museums, particularly the 2 mentioned above but it can’t surely have expected to gain inscription for such locations whose main heritage is “movable” (even if, as is the case with the Maximilian’s “Model Room”, they are all about “water”). In order to pick up Augsburg’s other noteworthy sights we concentrated our visit on the central area (1-9), together with the nearby cluster to the SE (2, 10 and 11) – but didn’t actually go inside any of the buildings. We thus “missed” out on all those power plants with their turbine halls which cover the late 19th and early 20th C development of the “water system” for the growing industries of the time via the development of new large canals - one channel is even called the "Fabrikkanal” (“Factory Canal”). The Meitingen power station dates from as “recently” as 1922 (as with all the others it still operates and has just completed a renovation of its turbines). I suppose they are “necessary” in order to provide a full history of the city’s “Water Management” - but all 10?? It must be said that (IMO) none of the sights we did see is particularly “noteworthy” in its own right – the strength (such as it is) of the Nomination would seem to lie more in the overall story it tells and that depends on a wide coverage of a lot of aspects! The SE cluster gave us a chance to experience the Stadtpark – Augsburg’s “green lung”, the Olympic canoe slalom course (No 2, which, despite Hubert’s doubts back in 2015, has apparently survived through to Nomination! ), one Waterworks (No 10) and the main “diversion” dam where the small man made canals start their journey through Augsburg – the Hochablass (No 11). The Waterworks apparently opens only the first Sunday of each month from May to October. The city will really need to do something about those very restricted opening times if it wants that “aufschwung” from all those tourists spending their money!! Closer to the Centre, the Lech kanals (No 1) are situated in what is now a residential/restaurant area (“Lechviertel” - Photo). This was once the location for mediaeval crafts/tradesmen utilising the running water diverted from the Hochablass for dyeing and tanning etc but, in German comparative terms, is, IMO, rather limited in its “historic” atmosphere” with a lot of rebuilding and modernisation having taken place. One presumes that the entire area will be within a core zone - the issue will be to what extent this zone will climb the “Hochterrasse” to the Obere stadt with its historic buildings but reduced “water significance”! Within the Lechviertel area lies the Stadtmetzg (no 3). It looks like some Renaissance Patrician House but was actually designed and built as the town butchery! It justifies its selection and separate mention because it was built over a canal in order to provide “cooling” and “waste disposal”! The Unteres Brunnenwerk (No 8) was once the site of a series of 7 Archimedes screws designed to raise drinking water to the city up on its ridge above the river, these were later replaced by water wheels (now also gone) and the pumping house is now a cinema. And then there are those 3 fountains (Augustus , Mercury and Herkules - representing masters, merchants and craftsmen) which have been given full billing in the nomination’s long title. My Augsburg map describes them as “magnificent” and “splendid” - well, they are “OK” (as fountains go!). Clearly they are “iconic” for Augsburg and their inclusion supports the strand in the nomination that relates its "Water management" to art and culture as well as to technology and manufacture. But the statues are all replicas (the originals are in the Maximilian) – does this not matter for their “Authenticity”? They would also seem to create a “core zone definition” problem – are they each to be given a little “core zone” of their own or will the whole of Maximilianstrasse and Rathausplatz be inscribed to include their overall setting? As might have been gathered - I was and am "reasonably" taken with this T List site. Though that doesn't mean I would rate it above 2* - this both because of the motivation behind it, which, I suspect, is more about Augsburg pride and profit than preservation of a “world valued” site (but it isn’t alone in that! ), and also because of its lack of "earlier" mechanical remains. The lengthy, "bitty" title reflects its rather contrived nature but we have to accept the WH system as it is, with the prizes going less and less frequently to the truly “World Class” and more and more to those who can be creative in assessing their assets and in spinning a good tale! It covers the same subject domain as the Aflaj, Qanats and Shushtar - albeit in a different geographical, cultural and technological environment. The nomination may lack “great sights” (like Shushtar's iconic mill area for instance - though some WH travellers might consider that massive turbine halls and/or ornate bronze fountains compensate for that!) but there is real “meat” in the story it tells, tracking Augsburg’s history and growth via 2 important strands of technological and social development - the provision of clean drinking water and the development of water power technologies. Regarding the latter aspect, I rather liked another quote from the Info-art presentation which described it as “das Erdöl des Mittelalters”! If you want a better overview of Augsburg’s “water story” I found this Wiki article to be useful. And you can even buy a comprehensive book about the nomination – “Augsburgs historische Wasserwirtschaft: Der Weg zum UNESCO-Welterbe”! I am pretty sure most people in Augsburg did not realize that the historic water management has the potential for a WHS until it was proposed for the new German tentative list. Other sites in Augsburg were discussed in the past, the Town Hall or the Fuggerei, the world's oldest social housing estate. But after the proposal was submitted, a lot has been done to promote this idea. Since 2013 so-called "Wassertage" (water days) are organized every first Sunday of the month in summer. Several free guided tours to otherwise inaccessible historic water towers and hydropower plants are offered. In June 2013 I had a business meeting in Munich and I took the opportunity to spend the following weekend in Augsburg. I visited the main sites of the nomination: the historic water towers at the Red Gate, the waterworks at the Hochablass and the hydroelectric power plant at the Wolfzahnau. Augsburg is located on a plateau at the confluence of the rivers Lech and Wertach. The water management in Augsburg began in the Middle Ages. Water from the two rivers and from small streams was conducted through the old town via a network of canals. The water was used for tanneries and dyeing mills, to drive water wheels, to supply the ditches of the city fortification, and to drain off the waste water. 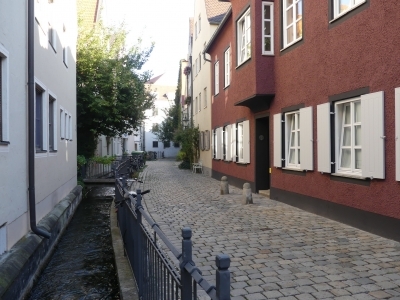 Most of the medieval canals have been preserved and make up the charm of the old town, especially in the Lech quarter, the former tanners and craftsmen's district. In the 15th century, Augsburg was a wealthy trading centre and so the city was able to construct an innovative drinking water supply. Because of the topographic situation - the upper old town is about 20 metres above the river level - the water had to be lifted in water towers. The height of these reservoirs produced enough pressure to transport the water through the water pipes to public wells and private houses. Five of these water towers have been preserved. I took a guided tour to the oldest towers at the Red Gate, an ensemble of three towers and adjacent building around a picturesque courtyard (photo shows two of the towers). The towers have a distinctive shape, the upper floors are octagonal or hexagonal. The tour was very interesting, the guide explained the technical details and the historical development of the water supply. Unfortunately, the technical equipment, the piston pumps and water wheels, is not preserved. But the Maximilian Museum in the city centre shows a large collection of historic models. The waterworks at the Hochablass weir is another main element of the nomination. In 1879, the water towers were decommissioned and the new waterworks was put into operation. From the outside it looks more like a palace or castle than a technical facility. Today it is still in use as a power plant, but the machine hall is a museum and can be visited (only on special occasions so far). Impressive are the three double piston pumps and the compressed-air vessels. The latter were a technical innovation, they replaced the water towers. The building and the machines are very well preserved, they have been renovated a few years ago including the ceiling paintings and the terrazzo floor. This was my favourite site in Augsburg. Next to the waterworks is the Augsburg Eiskanal, an artificial white-water river, which was built for the 1972 Summer Olympics as the venue for the canoe slalom competitions. I don't think that it will be part of the nomination, but it was nice to watch a couple of runs. Finally, I visited the hydroelectric power plant Wolfzahnau north of Augsburg, at the confluence of Lech and Wertach. You have to walk about two kilometres from the parking lot, then you arrive at a beautiful yellow-red brick building dating from 1902. It is privately owned and is still used as a power plant, thus it is open to the public only on special occasions. The historic facilities are partly preserved, for example a huge flywheel generator with five metres in diameter. The nomination includes a bunch of different sites, which cover a period of almost five centuries of water management: a network of canals in the old town, decorative fountains in the Maximilianstraße, historic water towers and technical facilities for water supply and hydropower. There is an interesting story behind these sites and all buildings are very well preserved. But still a lot has to be done to tell a coherent story and make it comprehensible and visible. At least, the sites must be open regularly. I was not expecting much from this T-list site, but I was pleasantly surprised, there is more potential than I thought initially. But I must admit, that I like to visit technical and industrial sites.